The New Horizons spacecraft is on its way to Pluto. It will fly-by the dwarf planet in July 2015. The spacecraft will have far too much speed to stay near Pluto, so after its visit the craft will continue its journey away from the Sun. Given that Pluto marks the inner edge of the Kuiper belt, it would be nice if New Horizons could explore other Kuiper belt objects. This is the goal of a recent search by the Hubble telescope. 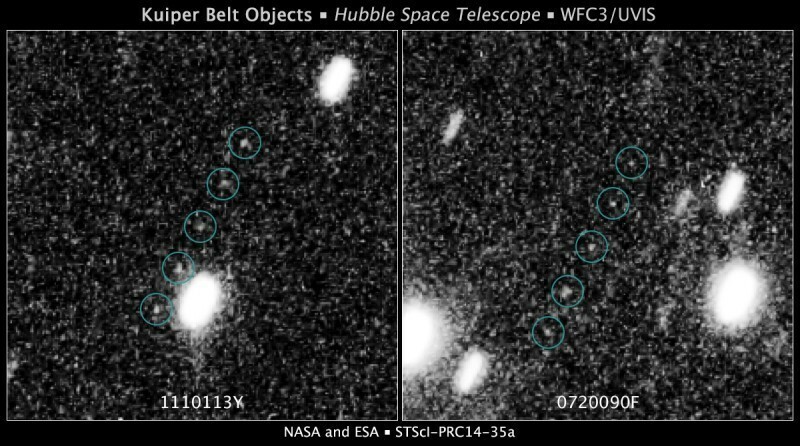 From now through August, Hubble will scan the skies in the region of Pluto in an effort to find Kuiper belt objects. So far, Hubble has found two such objects, seen above. If one is found within range, the trajectory of New Horizons can be adjusted to visit the world after Pluto, likely reaching the new object a few years later. Hopefully after Pluto we’ll be able to explore newer horizons. I live in San Antonio,Texas and know some of the New Horizon software developers working out of Southwest Research Cemter. They explained, while we watched our canine friends play, that the microprocessors onboard the spacecraft are 8 bit Z80s. Originally developed in the early 70s in competiition within the Intel 8080(5) the Z80 is still used extensively in spacecraft and in PLCs (Programable Logic Controllers) that are responsible for industrial production machinery operations.